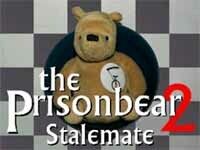 Following the success of Paul Smith's short-film "The Prisonbear - Revival", "Prisonbear II - Stalemate", part two of his magnificent series of spoofs, is now online. Inspired by the "Toy Movie" segments of the 1990s Channel 4 comedy series "The Adam and Joe Show", the "Prisonbear" films are a laugh-a-minute series of films using Teddy Bears and other toys as the main characters! We are delighted that both of Paul's films were successfully screened at PM2006. Thanks to Paul Smith for this news item.